To Cite: Sharifian S, Ghomian Z, Khodadadizadeh A, Jahangiri K. Assessment of Disaster Mitigation and Preparedness, Trauma Mon. 2017 ; 22(2):e41082. doi: 10.5812/traumamon.41082. Background: Strategic planning and objectives at the provincial and local levels should be consistent with the requirements, obligations, and official standards. Objectives: In the present study, we sought to assess the health system’s informative documents on disaster management used by the decision- makers. Methods: This was a qualitative research, which utilized content analysis. Seven national documents were selected from 9 national documents on disaster management. Valid checklists and data extraction forms were used for data collection. Results: Based on the United Nations disaster preparedness (UNDP) protocol, preparedness and mitigation strategies were investigated in national documents. We identified 52 strategies in disaster preparedness and 19 in disaster mitigation. The most mentioned strategies were related to organizational structure, resource planning mobilization, and strategies on evaluation, vulnerability assessment, and disaster response mechanisms. Conclusions: According to the findings of the present study, more attention should be paid to the mission and vision of the organizations in disaster preparedness. To improve the disaster preparedness measures, more emphasis should be placed on other disaster preparedness strategies such as response mechanisms and information systems. The fifth priority of the Hyogo framework is related to increasing preparedness in disaster response at all levels. Preparedness is one of the three elements of disaster risk reduction and relates to activities performed in the pre-disaster phase. The focus of prevention and mitigation is to reduce exposure to hazards; preparedness reduces the effect of hazards on the population (1). The capacity of the society to reduce the deleterious effects of hazards increases through increasing mitigation and preparedness. Integration of preparedness and disaster risk reduction can play an important role in saving lives. Improving preparedness leads to improving resilience and risk reduction of disasters. The focus of recent approaches in the field of disaster and emergency management has been on the comprehensive and systematic risk management activities such as prevention, mitigation, and preparedness, not just on the response phase (2). Planning for disaster preparedness should lead to development of measurable objectives and outcomes to strengthen readiness. It is necessary to develop a national framework in which all elements of preparedness, response, recovery, accountability, and investment mechanisms are represented in detail, published, updated, communicated, and executed (3). The administrative system of Iran is centralized at the national level and all national plans are developed centrally and then communicated to the regional level. Disaster management in Iran has become more important since the last decade, so developing national documents is important to recognize the gap and prevent duplication of actions in this domain. Most international disaster management documents develop according to the same approach. Therefore, all organizations and agencies that are involved in disaster preparedness and response should be familiar with the international and national policies and strategies to plan for disasters and develop a protocol at the organizational level (4). Strategies and objectives at the provincial and local levels should be consistent with the requirements and obligations at the national level. In addition, to achieve improvement, each national plan should be evaluated and revised at least every year. In the present study, the national documents on disasters were assessed to determine which important strategies in disaster preparedness. In the current study, we assess national documents, identified the concerns of the key stakeholders in disaster management, especially in the mitigation and preparedness phase. This was a qualitative research, which utilized content analysis. Seven national documents were selected from 9 national documents on disaster management. Document at the national level that had strategic items in disaster management and civil defense were included in the study. Inclusion criteria were as follow: The official and national documents, which had strategic items on disaster management and documents, were collected from the national library of Iran and official websites of various organizations. Valid checklists and data extraction forms were used for data collection. The coding unit was sentences that were related to the concept of preparedness and mitigation. This research was conducted in four phases. In the first phase, the contents of all documents were studied and strategic issues were selected. In the second phase, each sentence, which had the word or concept of preparedness and mitigation activities, was coded by a coder. In the third phase, codes were categorized in 22 preparedness subcategories and 19 mitigation subcategories. In the last phase, all subcategories were coordinated and categorized in 9 preparedness categories according to the disaster preparedness framework of the United Nations development program (UNDP) and 8 mitigation categories (5). It was possible to analyze data qualitatively using content analysis and at the same time quantify the data. The four criteria of credibility, transferability, dependability, and confirmability were used. Seventy-one strategies were related to disaster mitigation and preparedness; of them, 52 items were related to disaster preparedness, and 19 to disaster mitigation. Figure 1 displays preparedness and mitigation strategies in the national documents. As presented in Figure 2, the most frequent preparedness strategies had an organizational framework relating to 11 and 10 items on resource development and 9 items relating to training response mechanisms. Vulnerability assessment had the least frequency with only 2 items in 1 document. Planning was mentioned in 7 items, early warning in 6 items, information system in 3 items and response mechanism and evaluation were mentioned in 2 items in 2 documents. Figure 2 displays the frequency of strategies found in the documents. 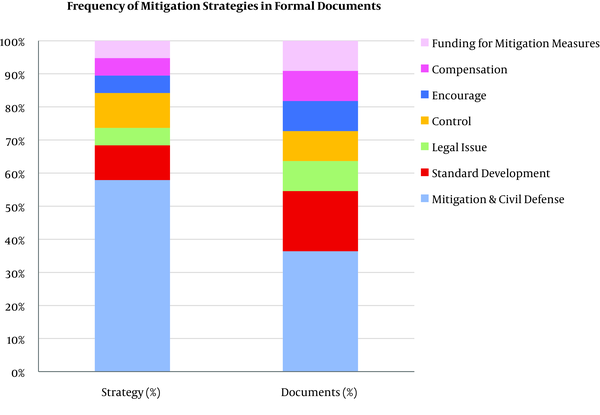 In mitigation strategies, the most frequent item was related to the integration of civil defense and disaster management with 11 items in 4 documents. Standard development was mentioned in 2 documents with 2 items. Other items were mentioned just once in 1 document (Figure 3). According to the findings, the most frequent items (11 issues) that were mentioned in all documents were related to organizational frameworks. In emergency and disaster management, coordination and cooperation of public and private organizations are essential at local, national and international levels. Salmon et al. (6) (2011) investigated the level of multi-agency coordination and its influencing factors in disasters. Furthermore, two studies showed that some factors lead to lack of coordination in disasters and emergencies; namely, lack of coordination failure in updating the rules, regulations, and guidelines in disaster management, and failure in assigning a commander in charge at the disaster management scene (7, 8). In study, results revealed that the institutional framework should be strengthened through the initiation of the relevant strategies, training, and allocation of resources (9). Planning is another strategy listed in the documents. The principals of planning include communication planning, coordination of volunteers, choosing a commander in charge, and surge capacity strategies (10). This ongoing process requires the cooperation of several organizations (11). Resource development and training in disaster and emergency management were also mentioned in 6 documents. The availability and accessibility of such resources as goods, services, and disaster relief funding should be assessed. Planning and assessment are two essential parts of disaster preparedness (12). We observed training strategies and drills in just 2 documents (healthcare reform; and a comprehensive plan, relief, and rescue). Therefore, more attention should be paid to clarifying the evaluation procedures in disaster preparedness. The information system was mentioned three times in 2 documents. One study found that administrative databases and GIS could contribute to evidenced-based disaster preparedness (13). The infrastructure can enable the rapid transfer of information, data, knowledge, and online connectivity from organizations at all levels among countries (14). Health policymakers should be aware of the need to strengthen the health information systems to support immediate disaster responses (15). Education strategies were highlighted in 6 documents. To have a resilient society, we should empower individuals to build their resistance against the negative and adverse effects inherent to disasters. Training and educating the community and performing a community-based approach to disaster preparedness is the most effective approach for achieving disaster resilience (16). Seyedin et al. (17) (2015), in their study, found that disaster-training programs could increase the awareness and skill of the nurses in disaster response and reduce vulnerability to sudden catastrophes. Vulnerability and risk assessment were found to be mentioned only in one document (the general policies of Iran in disaster management). While the foundation and development of disaster preparedness depends upon risk analysis and vulnerability assessment, the followings are paramount in disaster management: Risk identification, risk assessment, risk analysis, and risk evaluation (18). Early warning system (EWS) is an integral part of disaster response planning. Moreover, the preparedness phase strengthens the infrastructure, which was noticeable in the warning system (19). EWS was highlighted in 5 documents. Abiding by standards in disaster risk reduction could provide immediate benefits by improving economic performance and developing resilience in disasters (20). Legal issues were mentioned in 1 document. Rules and regulations are essential for building community resilience. In 2005, the Hyogo framework for Action highlighted the importance of good legislation to support disaster risk reduction (DRR). The Sendai framework for disaster risk reduction, adopted in March 2015, calls for a renewed focus for reviewing and strengthening legal frameworks (21). Eleven strategies in 4 documents highlighted the importance of civil defense. Civil defense can increase the capacity of the country to deal with threats of any disaster (22). After a disaster, the affected populations are motivated to reduce their vulnerability to future disasters. Thus, it can be done through recognizing the need for disaster risk reduction (DRR), building the capacity to tolerate threats, and safeguarding investments through allocation of funds and sustainable development (23). More attention should be paid to the official documents because the mission and vision of all organizations involved in disaster management should be in accord with the national vision, which is mentioned in these documents. Therefore, to improve disaster preparedness and mitigation measures in Iran, we suggest that the official documents be reviewed and other disaster preparedness and mitigation strategies such as response mechanisms and information systems be emphasized. The results of the present study are useful for the policymakers to help them recognize the gaps and weaknesses in disaster management plans at the national level. Moreover, the managers should be informed about the actions that had been taken in the past in dealing with disasters. Therefore, this article could be an appropriate reference to assess the quality of strategic documents in disaster management.